Happy Monday, everyone!! 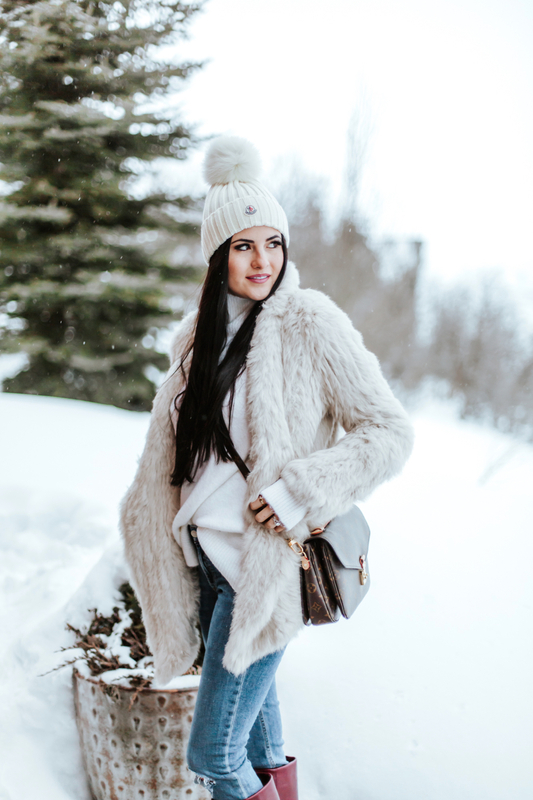 I just got back from spending the weekend in Deer Valley for the Sundance Film Festival with Cecelia New York! We skied, ate (a lot), went to different events going on for the festival and tried to stay warm. I can’t get over how much snow was up there, especially on Saturday morning! We woke up to a literal winter wonderland! I’m use to a lot of snow but this was crazy! Jackson tagged along with me and we missed Isla and Drew the whole time, but it was fun escape. Head over to my Instagram (@rachparcell) to find out where we are headed to this morning!!! We left at the crack of dawn (literally!! Our flight leaves at 6am!). 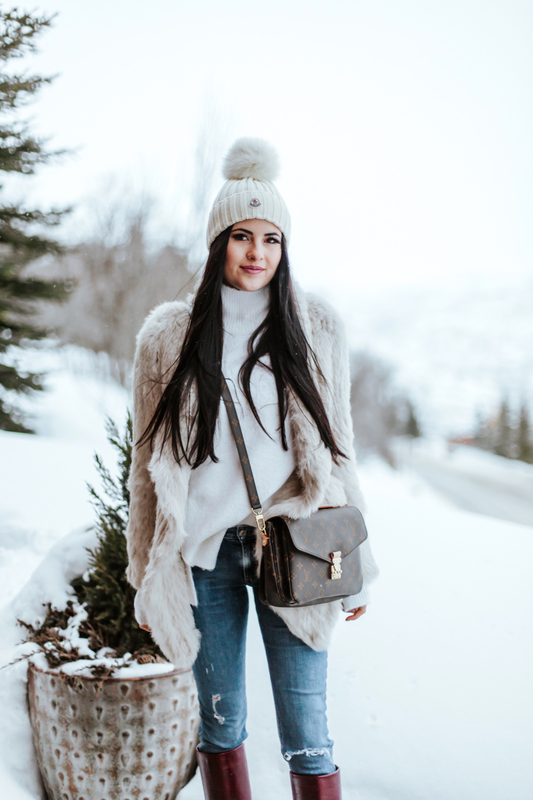 This is the cutest and coziest winter outfit! I love that coat and boots! Isn’t the view breathtaking?! Thanks for stopping by! I loved seeing all the snow post’s (so dreamy) and you are looking so good! Your boots are to die for pair and make this simple, comfy Winter time outfit a very special one! Looking very cozy and warm in this look! Hope you’re having a good time! Thanks Cathy!! It was a lot of fun! Love this outfit especially that cute hat! Hope you had an amazing time! Loving this winter look! Gorgeous! Those Tory Burch boots are to die for! Looks like you had an amazing time! What a perfect winter wonderland look! Color tone is divine, too! I love to wear white in the winter!! So you definitely should pack your white furry coat ;) Thanks for dropping by! 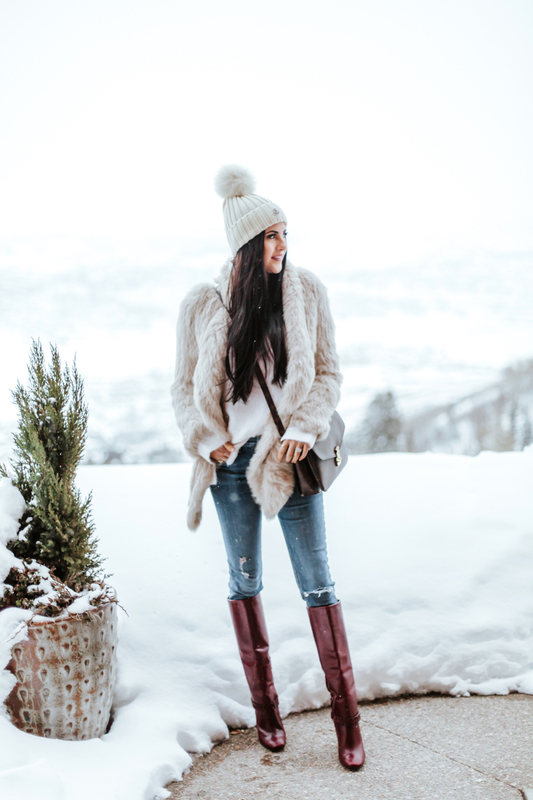 I am in love with these boots and this coat! Amazing! Thanks Diana! I love them too! Love the pop of color from your boots! I absolutely adore this entire outfit, Rach! I love that cozy waterfall cardigan and those gorgeous TB boots! I can’t wait to see where you’re heading, have fun and safe travels! These photos are soooo gorgeous! Really love how Alyssa edited them! Love this look! The red boots look amazing against the snow! The coat and boots are amazing. Must have been a fun weekend but also quite exhausting with a baby like Jackson. love those boots! super cute look! 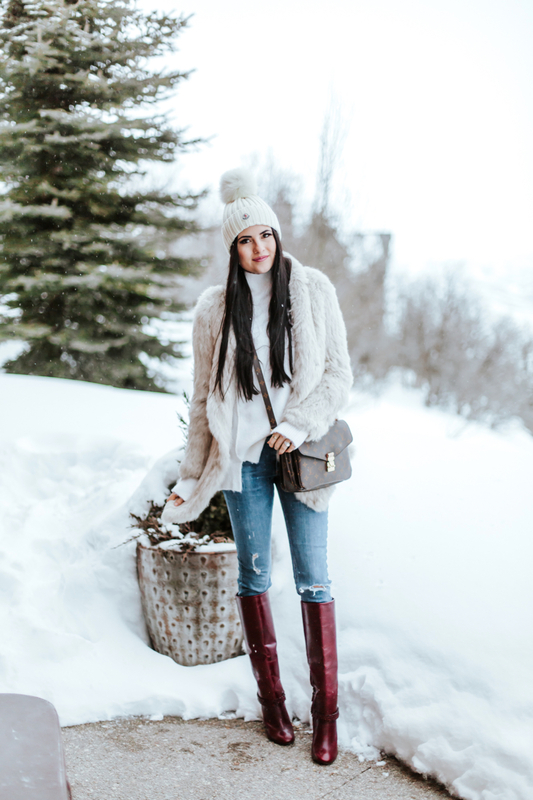 This is such a cute winter look, those boots are so stunning! It sounds like you had such a fun weekend! Have fun on the next trip! I’m totally loving that drapery fur coat! So unique and perfect for the snow! I’ve been loving that LV metis bag, and it looks amazing with everything you wear it with! Thank you so much, Kristin!! You are so nice! I love that soft jacket and the braids on the boots! It sounds like you guys had a great weekend. Oh wow, I love this look ! It is so perfect for the snow, your hat is so cute and I love the jacket as well, so cozy looking <3 Gorgeous !! LOVE this coat! I should have bought it when I saw you wear it year’s ago!